New Year’s Eve should be fun for everyone including seniors with Alzheimer’s. 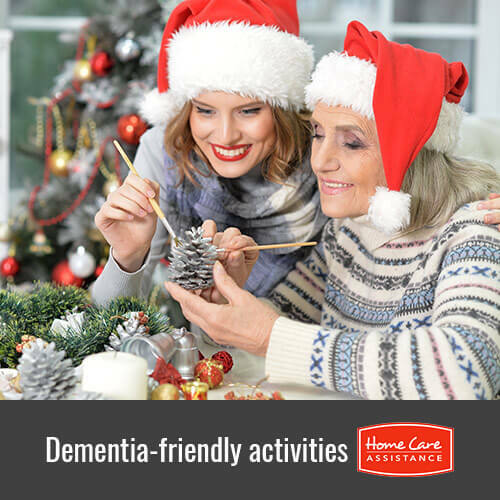 Therefore, Oshkosh Alzheimer’s caregivers should consider planning a family New Year’s Eve celebration this year with some of these exciting activities. Assign each person a country to research before the event and have them find out what people in that country eat on New Year’s Eve. Then, prepare that food and bring it to the family gathering. Before everyone digs in, have each person share what country the food is from and what people in that country believe eating that food will give them in the coming year. Alzheimer’s and dementia caregivers in Oshkosh may need to help their senior loved ones prepare these dishes, which will only add to the fun. Have each person choose a favorite decade. Then, create an outfit to match that decade. Each family member should try to create a two or three-minute routine about that decade. Perhaps they can dance to a favorite song from the decade or read a poem that was written during that time. Then, everyone has to try to guess the decade. Everyone loves to make resolutions on New Year’s Eve. Have each person write down three resolutions. Two of the resolutions will be true and one will be a lie. Everyone states his or her resolutions and then everyone guesses which one is the lie. Get a large calendar and write down all the events that have happened throughout the last year. Everyone can share how those events impacted him or her. Then, take a calendar for the next year and let everyone share what he or she hopes to accomplish in the coming year. Start by finding songs of each decade of the senior’s life. Then, play snippets from those songs. Have each person try to guess the name of the song and the artist singing it. The person with the most correct guesses wins a prize. Families can incorporate seniors with Alzheimer’s into their New Year’s Eve festivities in many different ways. Regardless of the activity or the food served, the most important thing is being together as a family. Learn more about activities that seniors with Alzheimer’s can enjoy by calling Home Care Assistance at 920-710-CARE (2273). Our flexible senior care in Oshkosh encourages seniors with cognitive disorders to lead active lives in order to boost emotional and physical wellbeing. Let us customize a personalized care plan for your loved one when you call.